We love the way Meli has styled herself in these photos. The combination of light and dark browns, olive tones, and the bright rust color of her hair make for a rich palette on their own, but more importantly, they bring attention to her stunning necklace. This brings us to a great tip: you can build an entire outfit around a single magnificent piece, whether it be a necklace, a skirt, or a waistcoat. It's worth the money to spend a little more on an item you adore, and then turn it into the focal point of your look. When choosing the rest of your clothing and accessories, make sure each item complements your statement piece in some way. In this example, the scoop neckline of Meli's shirt and the open jacket showcase the necklace without covering it. The subtle floral pattern on her top mimics the scalloped shapes of the necklace's segments. Each clothing item (and her hair) brings out a color in the necklace, while the chocolate brown jacket provides a contrasting tone that makes the necklace pop against her pale skin. 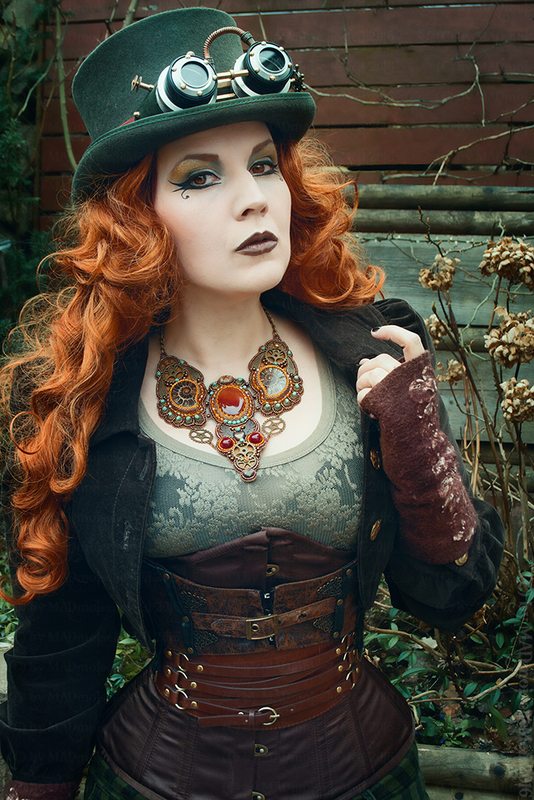 The next time you're trying to put together a Steampunk outfit and you're feeling uninspired, find (or create) just one piece that you love, and then make the rest of your ensemble all about showing that piece off.